1964 Rioja Real Reserva Especial – half bottle. 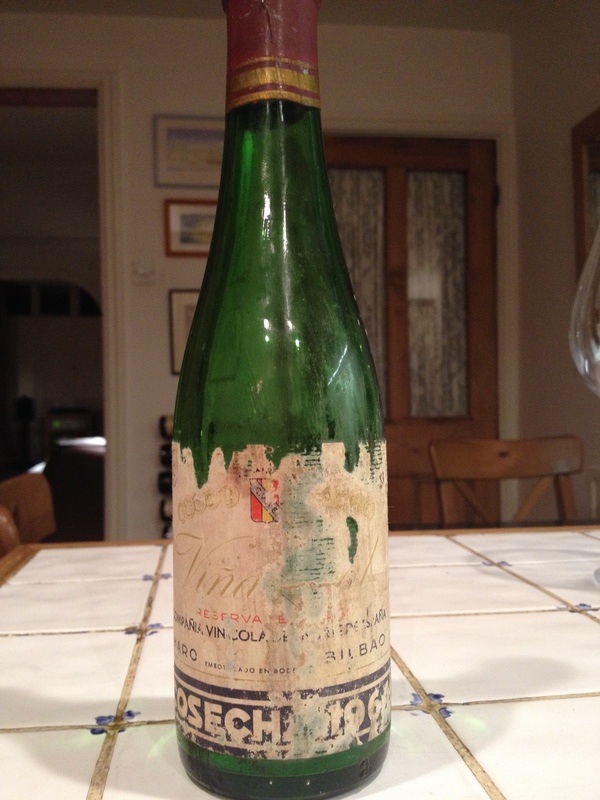 It’s not very often I get to sample a wine nearly 50 years old and especially one from a vintage tagged ‘of the century’. On one October Friday evening in 2013, the cork was very gently drawn on this wine. It told us the bottle had been well looked after; dry mould on the top and stained a deep red. It was stamped with the company’s logo, CVNE. (I know this all seems very pedantic but Richard and I were savouring every moment. The colour of the wine was remarkable. The deep red core was clear, no sediment apparent but the rim shone with bronze, not brown but a glistening amber. Initially dumb on the nose there was a slight cherry aroma which still was fresh. This developed into a fragrant yet restrained bouquet of red fruits. The palate was wonderful. Freshness was joined with richness and complexity all combined in a silky mouth feel. There was a savoury quality in its leanness which developed into a slightly rustic quality and restrained tar/coal flavours. It had good length and was a complex, layered wine. The overall impression was of a vital, well-made wine of complexity and interest. We wondered how long it would last as it did not exhibit its years. One word described this 50 year old – ‘freshness’.